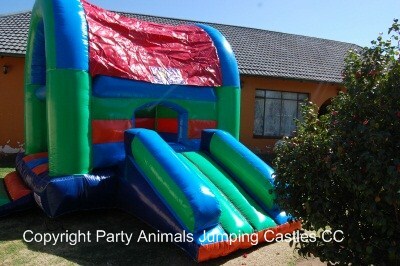 The Medium Slide castle is a Jumping Castle with a roof and a slide at the side. The slide extends from the window on the bottom wall. This makes it safe for all kids. The castle has a roof which keeps the castle dry and provides shade in the heat of the day! Colours: Green, Spec Blue, Dark Blue and Orange. The motor is a .75kw motor with a 15m extension lead. If your power point is further than 15m form where the castle will be placed, you will need to supply an additional extension lead. 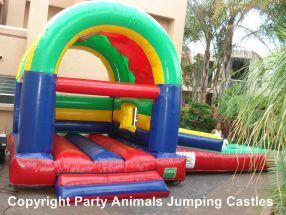 These are not provided by Party Animals.